Do you find your current critical hit and fumble system a bit boring? Do you tire of rolling a critical hit or fumble only to have to roll again to refer to a chart? Do you want to give your players a visual description of their critical hit or fumble? Then this critical hit and fumble deck is for you. 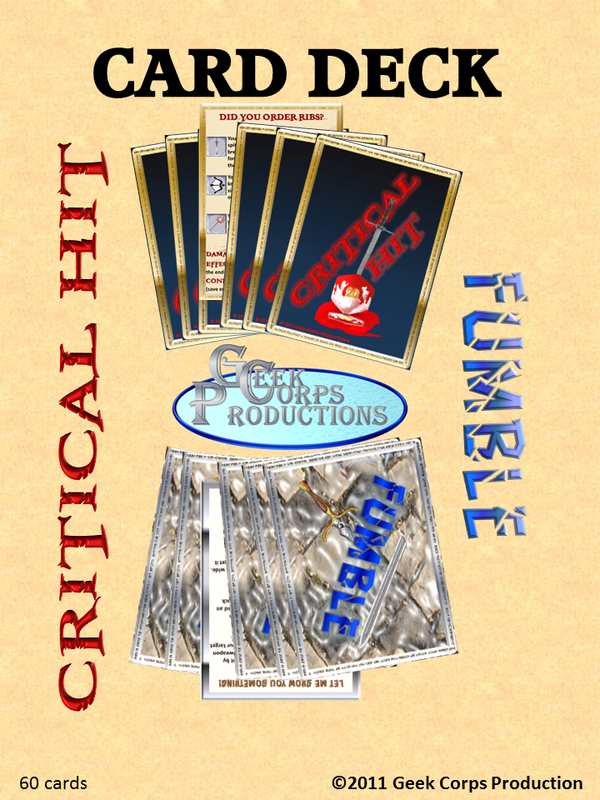 With 30 unique critical hit and 30 unique fumble cards; you have a variety of results for those rare critical hit and fumble rolls. This deck was developed for Dungeons and Dragons 4E. They can also be easily used with other d20 systems. They are great for adding an element of storytelling to your game and putting a little tension in the moment. The work is already done; all you will have to do is pick up the card and read the flavor text. Get your deck today!